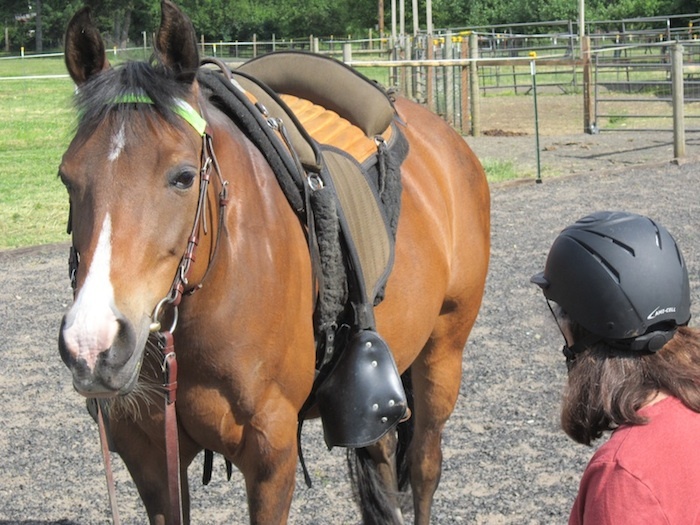 How will “Being Still” in 3 Minute Horsemanship with Lexi work in another situation? This time I decided to change it up. I tacked her up (with a “Softride Treeless” saddle, made in Oregon). I led her to the mounting box, but instead of mounting up, I sat down on the box. That was not what she expected. Then I tapped into the “horse-breathing.” It was a windy day with plenty of activity–horses running in the field, my husband moving ladders, neighbor’s dogs in their field, plenty of movement to look at! Her feet didn’t move. She was just high-headed and tense, but not scared. I started by looking at the things she was looking at, and then remembered to create a different world. I softened my expression, glanced downward, cleared my mind, and slowly and regularly did my “horse-breathing.” After maybe a minute or so, she lowered her head to about withers height. She didn’t feel connected to me, but she wasn’t looking at all the distractions. A minute or so later, her head dropped below her withers. Now she was relaxed, but still aware of the goings on. Today’s lesson took more than 3 minutes, but was worth it as she soon pressed her head to mine. What a lovely way to connect, and to begin a ride! I wonder how this will work, or if it will work when we go visit an outdoor obstacle trail course in a couple of days?